By checking injector feeds one by one, I've confirmed that all 6 injectors are receiving switched ign +12v, and are correctly connected to the pcm. Here's the weird part, plugging in 1 injector at a time and cranking reveals that injectors 2, 4, 6 fire every time. 1, 3, and 5 maybe fire once, and then don't. If I plug in the '96 pcm from the lasabre, engine immediately fires up on all 6. I've verified that the '97 firebird pcm has the same grounds and injector pins. So, at this point, the PCM is either bad, or my bank 1 o2 sensor absolutely NEEDS to be wired up fully before bank 1 injectors will fire. Is there a good way to test that bank of injector drivers on the PCM? I really don't want to swap the PCM unless I have to, have already paid HPTuners for the license..
Wooo Hoo!!! Music to your ears NO DOUBT!! Way to go ... Fiero Fest 2012 here you come! Much as I hate to admit it I should have listened to Darkhorizon and gone with the 98-02 PCM from the start.. I guess the Grand Prix PCM doesn't have any active theft deterrent built into the PCM, it stays running just fine out of the box. I still can't believe that '97 camaro PCM was bad, does that happen often? Oh well.. I'm only out the $100 for a new HPTuners license.. Anybody have a specific list of things needing changed for a L36 with a 4 speed muncie setup? The camaro pcm was already from a stick, is there anything else I need to do to make sure the pcm doesn't go into limp-home mode or something? I just read through this. Nice build. Any updates? 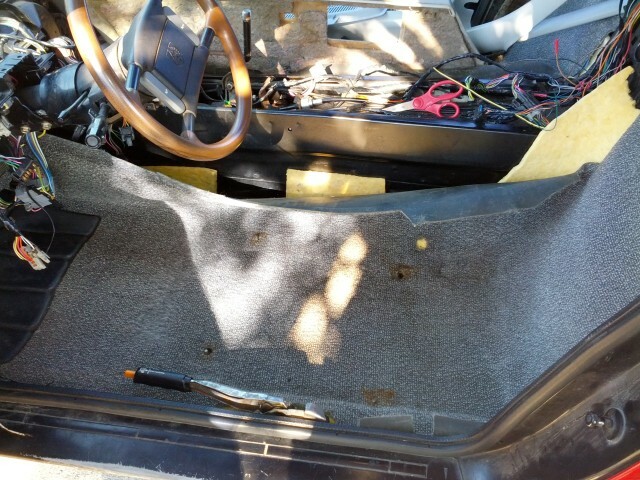 Not too much.. Just fixed up a bit of PO wiring, and re-attached and secured the steering column (I really hate crawling in there upside down, especially since I'm 6'4".. ). I've been busy saving and planning for my trip to GeForce LAN 6 with my oldest son this week. Now that the car is actually almost done tho, I'm getting excited again. It's hard to stay motivated for a multi-year project, but I'm trying very hard to make sure family comes first, before the car. If it takes a while, so be it. Small update: I got a set of new-looking grey seats on Saturday. In the next week or two, I'll actually try to get this pig on the road! I drove the car under it's own power for the first time! Not too exciting, as I just backed it out of the garage and up the car trailer, but it still felt good. It's now at Joe's (FieroKing) getting an exhaust made for it..
After this, I need to get the interior put in, panels re-attached, a new battery and battery cabling installed, and it's off to get an alignment! Won't be long now..
Who still has dial-up these days? Don't have to be concerned with the ign contacting the firewall plus moves the weight of the alt closer to the middle of the car. Sounds good Aaron! I know Katey and I missed last year but we will be at Fiero fest this year and I expect to see you and your car there! I don't know about Katey but I sure know I could use some more of those alcohol fueled words of wisdom! As long as Jeff shows up with Gummy Bears. Unfortunately, I tried making my own exhaust manifold gaskets with that copper stuff, and it leaks a bit, so I'll have to order some big-boy gaskets. Car is home, and the re-assembly has started. Bad assed! Call me if you are looking for any extra hands this weekend. Ok, now I'm confused.. It turns out I didn't cheap out on the exhaust gaskets, so now I need to do some sleuthing to figure out where the leak is. Hmm. Seems like if it's not one thing, it's 5 others..
Got a pic of those front wheels mounted? I read on the front page your offsets and wanted to see what they looked like mounted. I'm looking at the same style for my '88. 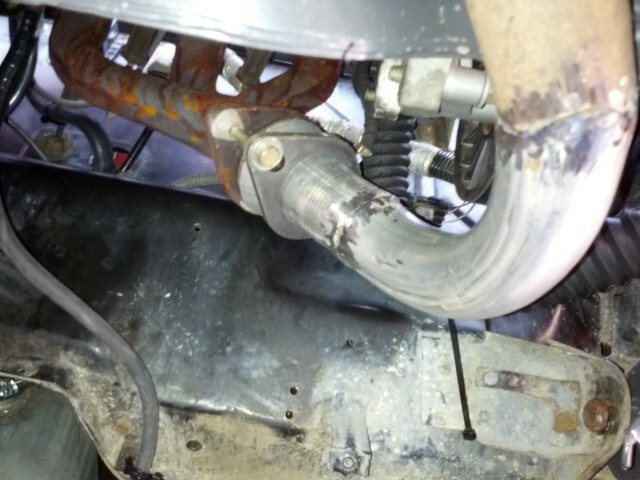 I had a couple of hours Saturday to take a look at the exhaust leak. Turns out, Joe's slipping in his retirement years and just forgot to tighten the bolts to the front flange. ROFL. Just need to re-assemble now, and get it aligned. We have a bunch of family stuff happening this week, but maybe this weekend, I'll have the panels on and the interior back in. Ok, finally got the battery mounted up front, and got the wiring run. Also, since I fixed the exhaust leak, and Spencer (Shill) came over, I did a quick sound grab video to show you guys why I went with the F-body manifolds. The car sounds a LOT like a stock V6, which in my mind is a great thing.. Especially since 3800's get a pretty bad rap for engine sound. That's awesome. It can't change the firing order without changing the crank but it changes the exhaust pulses? Do you have any idea if this will work with a Series II or II supercharged? Just to clarify, this IS a series II... Also, both the 60 degree v6 (2.8, 3.4, 3100, 3400, 3500, 3900) and the series II and III 3800's all fire a cylinder every 120 degrees of crank rotation. On the 60 degree engines, there is an additional 60 degree splay between cyl 1&2, 3&4, 5&6. On the series II and III 3800's, they are 90 degree motors, with a 30 degree splay between pistons. The difference is in the firing order. 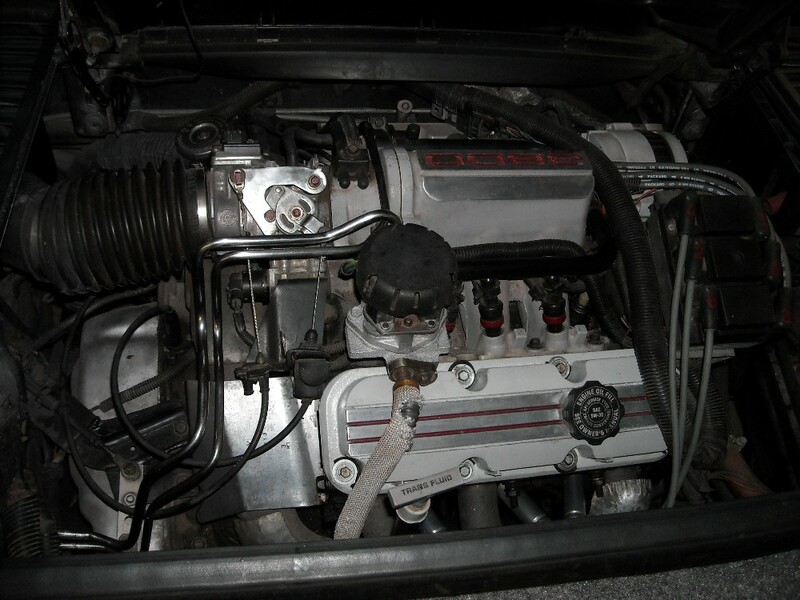 On a stock 60 deg motor (like the stock fiero), the firing order is 1 2 3 4 5 6. The exhaust goes from the passenger side to the drivers side, so the firing pulses are from the furthest away (to the y-pipe) to the closest. 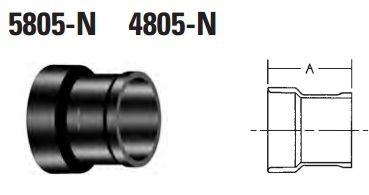 On a stock 3800 exhaust, the pipe is oriented the same way, but the firing order is 1 6 5 4 3 2. This means that the pulses go from shortest to longest. I don't know WHY that makes them sound like poop stock, but they do. The F-body manifolds usually face towards the transmission in an f-body, giving them the same short-to-long pulses. I flipped them, pointing them towards the front of the engine. This means the pulses are 120 degrees apart (just like the fiero's 2.8) and are ordered the same down the tube, so longest pulse, then middle, then shortest -- same as the 60 degree with a stock exhaust configuration is oriented. You wouldn't believe how many people told me it wouldn't work.. But math usually does. Thanks for the info and proving them wrong. That looks like an N/A engine. I'd love to do this with a SC2 or SC3, but will they fit without interference on the supercharged version? I like the idea of the fbody manifolds. What year car are they from? 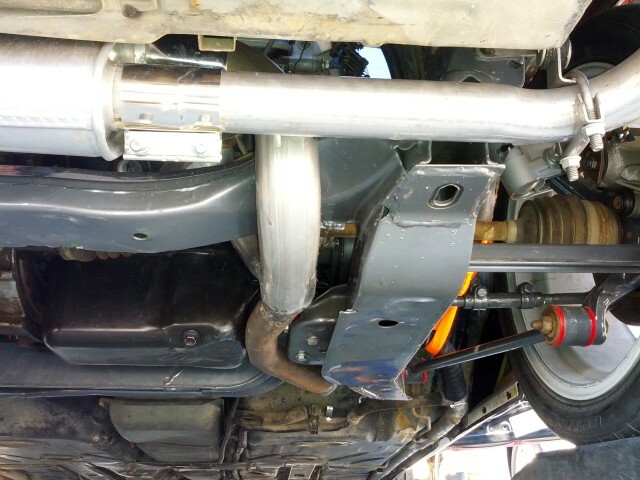 Also, how did you route the exhaust system? I'm pretty sure they're off of a 2002 L36 firebird. I just walked into a wrecker and told him I needed a set of manifolds from a 3800 based f-body. He handed me those for $30 or so and they fit. Sorry, about the routing, I'll have to get pics for you when I go back under. 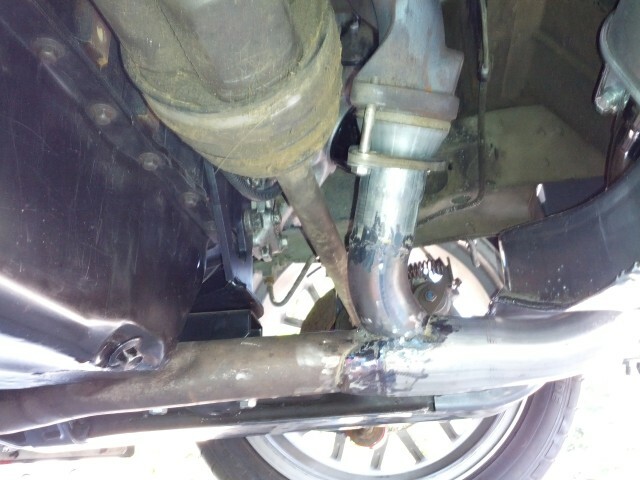 I'm planning on pulling off the exhaust to remove a rattling heat shield, so I'll take a pic of the whole exhaust off the car for you too. I replaced my temporary heater return plug with an actual plug that can tighten down, and ran the car for a while today. Even though it was pushing 90 here today, it ran nice and cool. After about 15 minutes of idling, it hit 195, and the fan came on as programmed. Then, it even shut off after dropping to 180. So, since I have no more mechanical projects to dive into, I figured I'd get busy on the body. Spencer came over (Shill) and offered me moral support.. 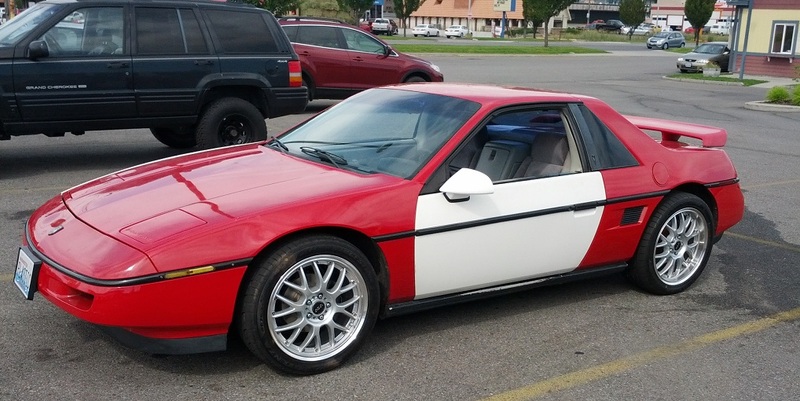 I really really want to drive to fiero fest on Aug. 10th. Tomorrow I'm tackling the interior. Don't pick on me for my white panels, when I bought the car the two panels that I've replaced were cracked. I had the white ones off of a parts car, and the whole car will be painted white at a later date, so it worked out well. Looks goofy now, but I just want to drive it. I've called a few times and gotten your VM.. I'll be wrenching tomorrow if you're bored.. 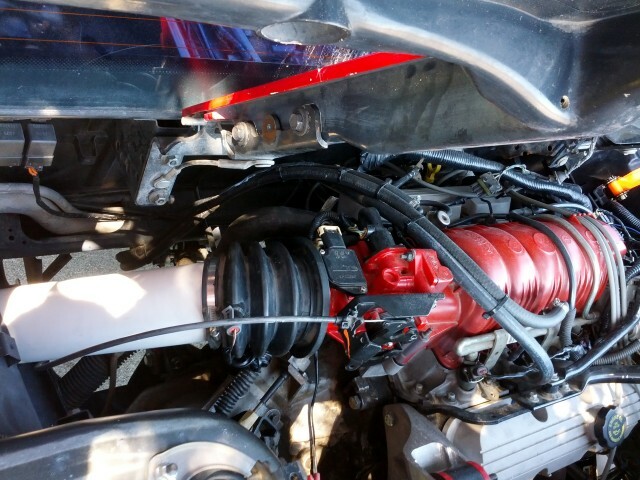 I built an intake out of 3" PVC, using about 12" of 3" PVC pipe, something called a no-hub adapter, and a Fram CA9345 filter. 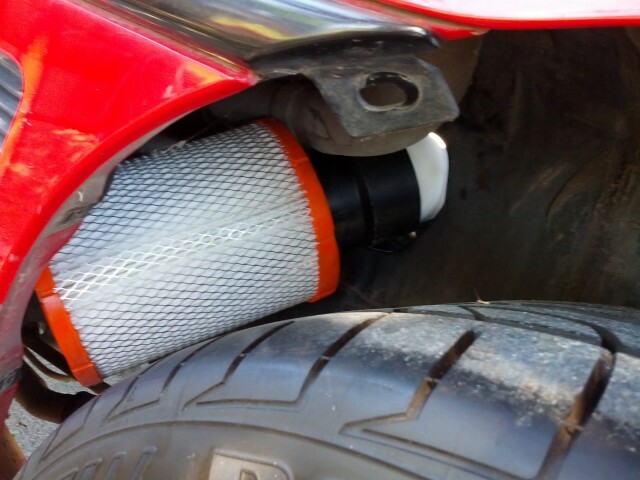 The stock L36 intake rubber attachment takes a 3.5" pipe, and 3" ABS/PVC is 3.5"OD, so SCORE. I don't have any exhaust on that side of my motor, so I'm pretty sure it'll stay plenty cool over there for the plastic. I ran PVC straight from the intake to the "No Hub adapter." The reason I chose this piece is that it slip fits over the 3" pipe, and then has a 3.5" section with a raised lip at the end to ensure that the filter can't work loose. The filter is a Fram CA9345, and is sealed on one end and a 3.5" slip fit on the other. I had to lube the no-hub adapter with wd40 and stretch it on, and it ain't going anywhere. 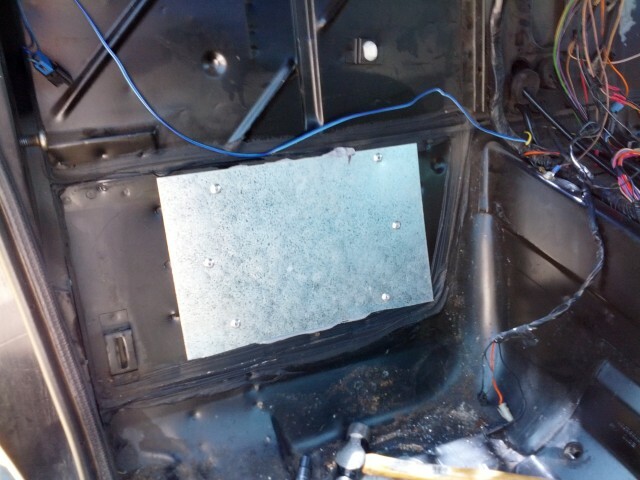 Next, I went to work sealing the holes that some ninny cut in the firewall for speakers. I got a tube of seam sealer, cut some panels from galvanized sheet metal, and gooped / riveted the panels on. Done. Then, I pulled the carpets out of the garage, and all the interior pieces that have been sitting in boxes for years, and cleaned them up. The stupid cats peed on the underlayment, so I had to make new ones from heavy closed cell foam. Then I put in the carpets, and almost died from heat exhaustion. I'm done for the weekend.. Finally, somebody PM'ed me about exhaust routing. I crawled under and took some pics. All for now, more later. I pm'd you. Thanks for the pics. Looks and sounds great! 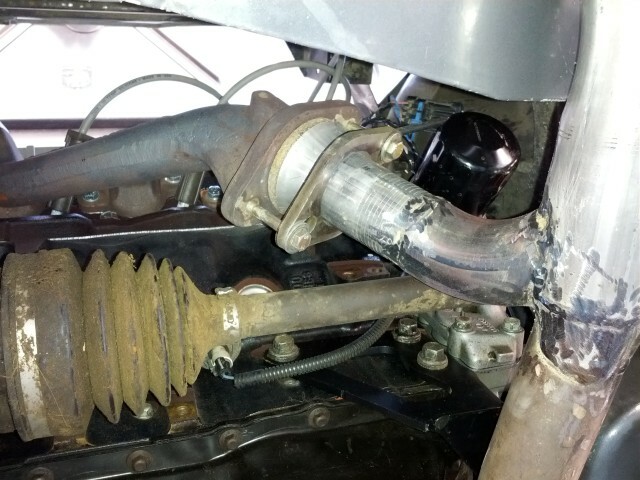 Your exhaust system looks similar to what I came up with for my 4.9. Here's a pic to show what mine looks like out of the car. I've enjoyed following your progress. Keep up the good work! Well, it's not painted yet, but it's all back together, and it's getting aligned tomorrow. I took my wife up and down the street for the inaugural drive, and she feels really good. I would be posting pictures, but it was too dark. It was really hard to be nice on the throttle, the L36 has a really nice torque curve. The motor isn't broken in though, and the alignment is WAAAY off, so I didn't want to tear things up too badly. 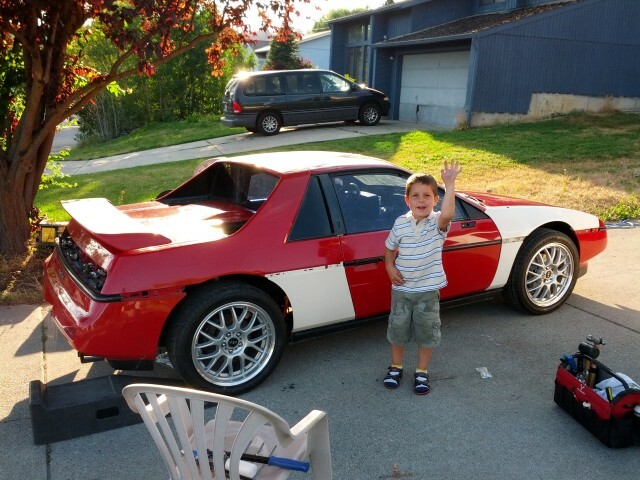 Looks like I might make it to NW Fiero Fest this year after all. 3 years, and 3 months, working only in spare time. You just gave me goose bumps! Congrats! I will be attending the caravan on Friday. Woo Haw! Congrats! Post some picks up. I think I gave myself heat stroke yesterday, as I felt like the shaky dead today. But, after lots of water, some exciting moments in the bathroom, and some rest, I dragged myself over to Les Schwab to get the car aligned. 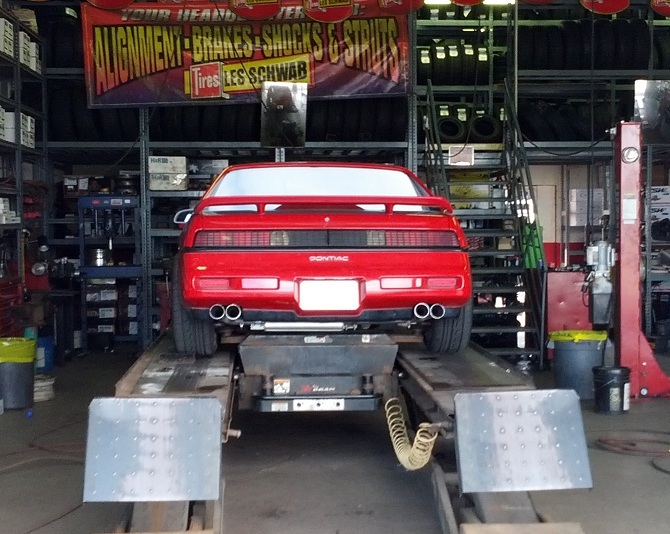 The guy that did the alignment was extremely good at his job, and had me back there a couple of times making sure he was setting it up like I wanted. Here is the multi-colored (for now) plastic pig waiting to get her screws turned.. I'm happy to report that everything is awesome. Drives straight, no wiggles, shimmy, vibration, or anything else. I can't believe how smooth it rides, was expecting a bit more unnecessary roughness with poly bushings, lowering springs, and lower profile tires. 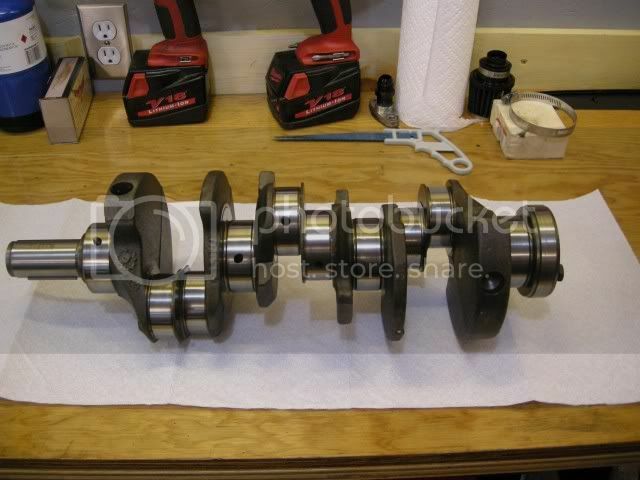 Oh, and another thing, I absolutely LOVE the 3800's amazing torque profile, and I only have the NA. Granted, Joe Jr. did a BUNCH of cleaning up on the heads, and the exhaust is pretty free flowing, but MAN it feels good. It's all I can do to keep my foot out of it. I started searching for 3800 high idle on google, and low and behold, the set screw on the throttle body had been turned WAAAAYY in. I backed it out til it was no longer "helping" the throttle stay open, and the problem immediately disappeared. DOH. At least it was an easy fix. Also learned an interesting tidbit: The PCM will happily control the radiator fan via the relay and the car runs nice and cool (about 3/8 up the temp gauge, 192 indicated on scanner). I don't have AC in my car anymore, but if I run the engine fan via the AC button on the climate control, the PCM throws a P1656 code when it "sees" the floating relay voltage go to ground. The code reads something like "Fan relay driver voltage not as expected." Guess I'll have to just trust the PCM... It works quite happily on it's own. I've got 40 miles on the clock today, and no other problems at all. Starts instantly (not even a half a crank), runs SMOOTHLY, pulls evenly, and has the most insanely awesome wail while accelerating with the combination of the free-flowing intake and my weirdo exhaust. I sounds a lot like a 370Z, but deeper. I'll try to figure out a way to get it on video. 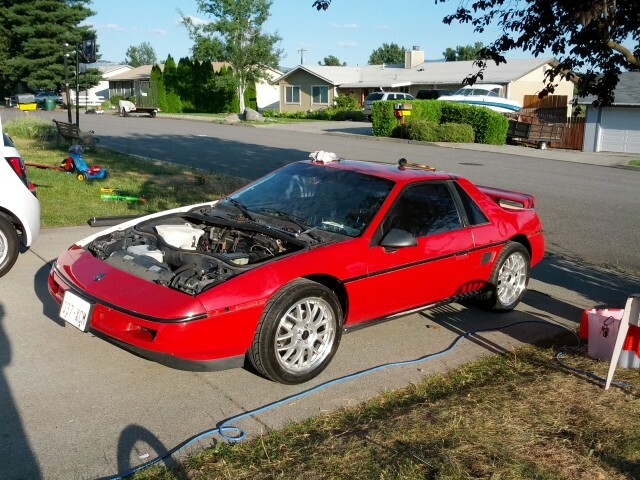 Thanks to everybody here in Spokane / Cd'A who helped me so much over the 3+ years it took me to get to this point, Looks like I'll finally have a Fiero at NW Fiero Fest this year again. Wooohoooo! Nice work! Katey and I are looking forward to seeing everyone and hanging out. Enjoy that car of yours you deserve it! Some videos since I had some helpers..
Spencer (shill) grabbed one more vid as we came back around..